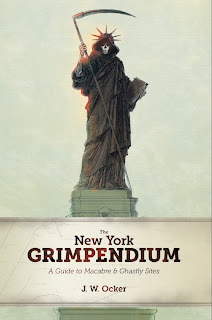 We're looking back at some of the entries of The New York Grimpendium with unpublished photos and adapted accounts of my visits to these macabre oddities. Pick up the book today! February 3, 2018 — We know him as the man who put cameras into the hands of the masses. The Grim Reaper knows him as that impatient guy who cut in line. 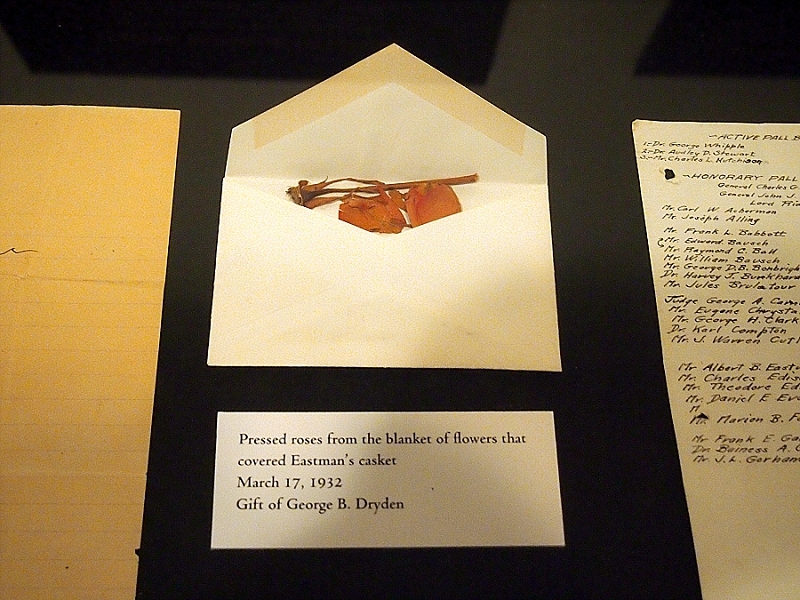 George Eastman was the founder of the Eastman Kodak Company and the inventor of roll film. He was also the author of the most compelling suicide note in the history of that literary genre. Eastman was born on July 12, 1854, in Waterville, New York. His family then moved to Rochester, where he lived the rest of his life and where the Eastman Kodak Company is headquartered to this day. It was at the age of 24 that Eastman started experimenting with photography, during a time when that involved chemicals, plates, giant cameras, tripods, and portable dark rooms. He refined the cumbersome techniques, patented a device to produce large numbers of plates, and jumped into the camera business. Eventually, he invented roll film, which changed everything, from making cameras truly portable and less expensive to paving the way for the birth of the movie industry. In fact, long before the digital revolution put cameras everywhere, cameras were everywhere…and that’s pretty much thanks to Eastman. 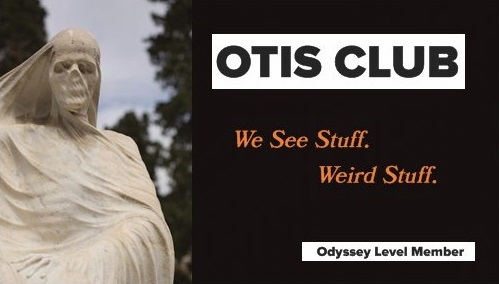 He wanted everybody to have a camera, wanted them to be as “convenient as the pencil.” He even gave out free cameras to half a million 12-year-olds to foster a camera culture. As to the other half of the company name, Kodak was just a simple trademark that Eastman invented, a word that sounded cool and would eventually overshadow his own name on the marquee. Although he never found the time or will to marry, Eastman did finally slow down, and while he never fully left the company he founded, he dedicated himself to all the things that extremely rich people do, massive philanthropy and extravagant hobbies. Unfortunately, toward the end of his days, he developed a spinal condition that severely hobbled that lifestyle, and on March 14, 1932, at the age of 77, he shot himself in the chest with a Luger pistol. And that’s probably the most interesting part of this interesting story, at least to a guy obsessed with death-related sites and artifacts. 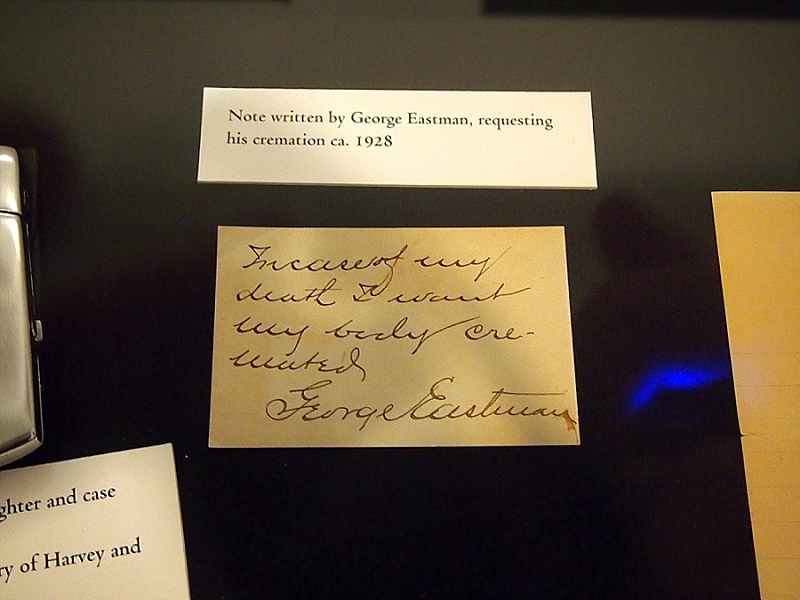 Eastman left a handwritten suicide note, on a simple, yellow, lined piece of paper. Addressed “To my friends” and signed with his initials, his explanation for his self-demise was a mere six words long. It read, “My work is done. Why wait?” It’s one of the few inarguable statements set to paper. 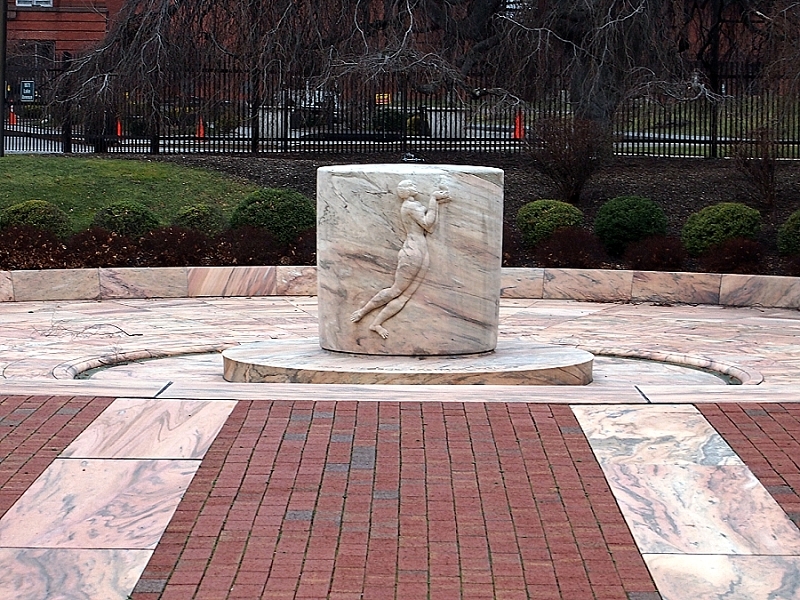 Eastman left marks all over Rochester, the surrounding area, and even the country. His Waterville birth home was moved to a museum in nearby Mumford, his mansion is now a museum operated by the University of Rochester and called the George Eastman House, his name adorns various institutions and localities, and he’s had monuments and statues erected to him. His ashes are interred in a memorial on the property of the company he founded, at 1669 Lake Avenue. The memorial is publicly accessible in what’s called Kodak Park, right on Lake Avenue itself. There, you’ll find a brick and pink marble courtyard area anchored by a simple, low film-canister-shaped cylinder of the same pink marble and carved with a pair of human figures on opposite sides of the cylinder, a female form representing aspiration and a male representing science. 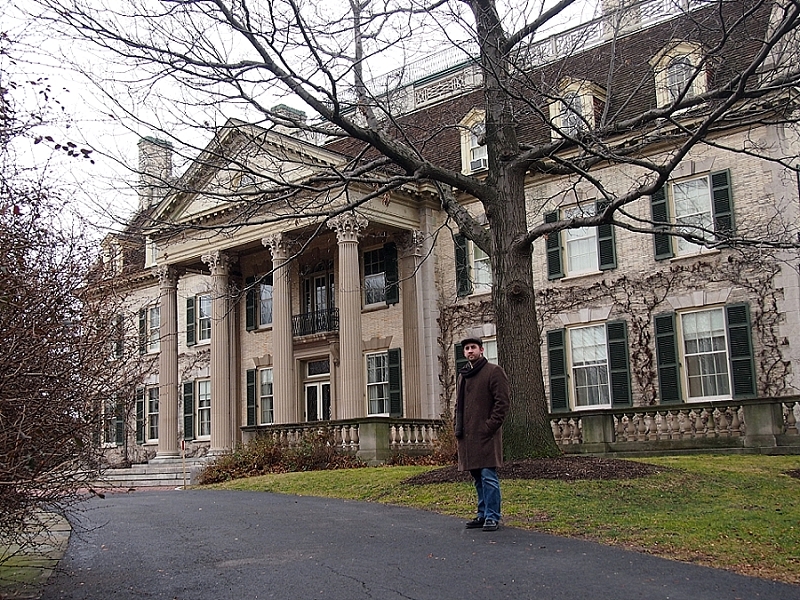 To find the cause of those ashes, all you have to do is visit the aforementioned George Eastman House, which is about 11 miles away. Located at 900 East Avenue, the 35,000-square-foot, century-old mansion features about 50 rooms on three floors, two of which are publically accessible. You enter the mansion from the back, where they’ve added an art museum for photography exhibits. 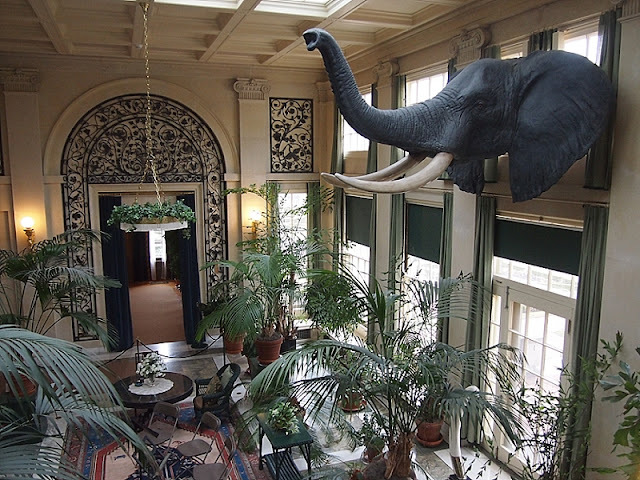 Once you’re in the mansion proper, it’s mostly dedicated to the life and work of Eastman, with extravagantly decorated rooms filled with unique furniture and books and hunting trophies. And, of course, cameras. 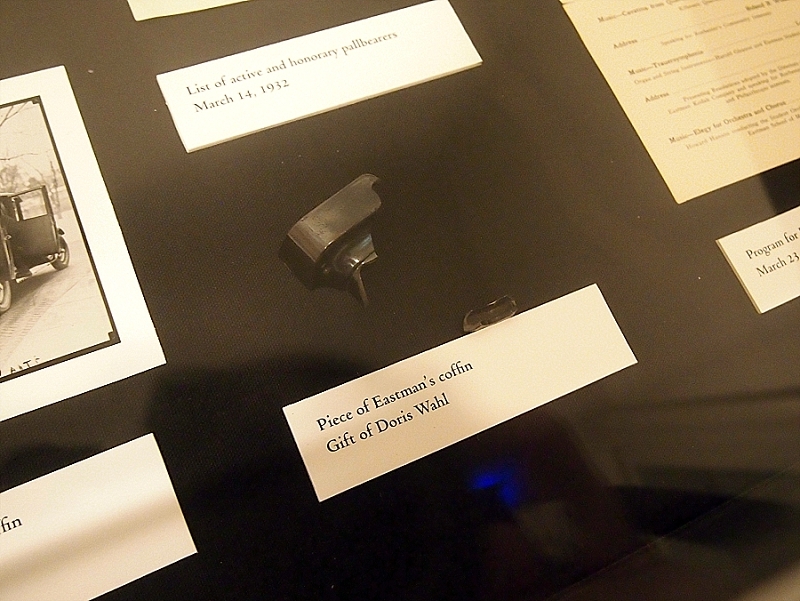 The most interesting bit is in a small, blank room on the second floor that’s part of a series of exhibits. In it, is a single small glass case, within which is the yellow sheet of paper upon which Eastman scrawled his final words to the world, after entertaining some friends and associates and then signing a codicil to his will naming the University of Rochester as his main beneficiary. 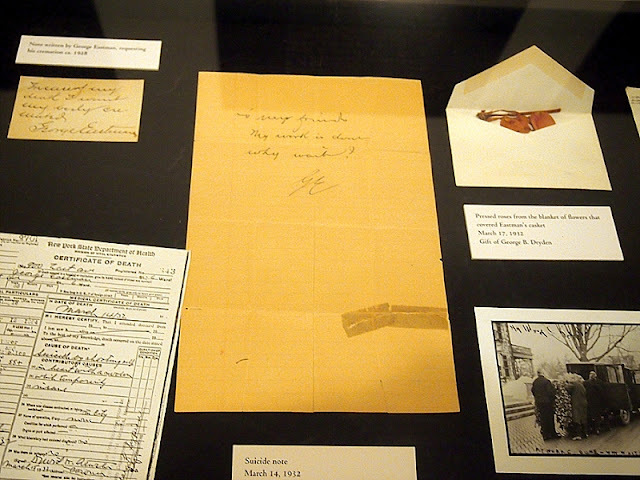 Actually, the entire exhibit focuses on his death, with a piece of his coffin, that codicil to his will, his handwritten request to be cremated, his death certificate, dried roses from his coffin blanket, and a program from his funeral service, among other items. Pretty much everything except for the gun itself. “My work is done. Why wait?” I don’t whether it’s the succinctness of the message or its humility in not trying to impart any wisdom gleaned from a lifetime of success and experience, but the note is completely arresting. And that’s whether you’re merely reading the words in a book or seeing the simple yellow piece of paper firsthand. And, of course, I took a photo of it. This fascinating macabre site and some 250 more can be found in the dark depths of The New York Grimpendium. Buy it today.